As parents we lead and manage our children. If we lead without adequate management skills, logistical problems arise. 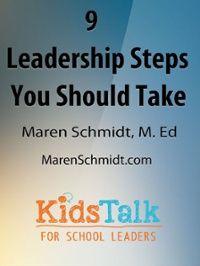 If we manage without providing clear leadership, we may travel a long road to nowhere. Leadership focuses on developing people, empowerment, doing the right things, direction and principles. Management, on the other hand, concerns itself with taking care of things, control, doing things right, speed and practices. Leading is an art. Managing is more about skills and organization. Parenting is the delicate balance of knowing when to guide and when to supervise. You might enjoy The 7 Habits I did this past year on my For School Leaders blog. I love this article in its clear succinct manner of differentiating between the two skills. A great leader must have both the vision and charisma to lead while the practical skills of managing people and things. Well stated.